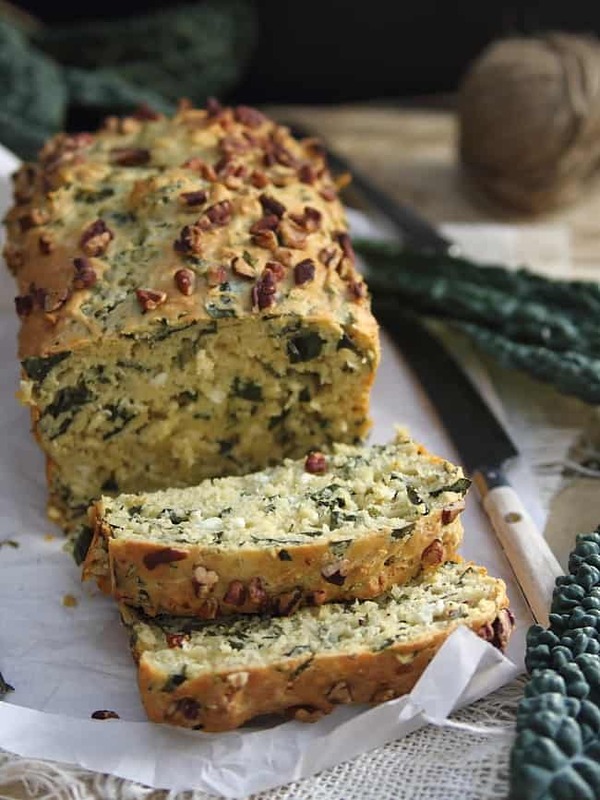 Easy savory quick bread recipe with feta cheese, kale and einkorn flour from guest blogger Gina of Running to the Kitchen. You know it for sure. It was the one where the contestants could “phone a friend” if they needed help answering one of the questions. Well I was thinking about that expression, phone a friend, today when I was thinking about how best to introduce my guest blogger. I feel like I am one of those contestants who has gotten into a bit of hot water, and needs help from a trusted friend. Gina from Running to the Kitchen is indeed that friend I would phone to fill in for my brain cells while they are otherwise engaged. 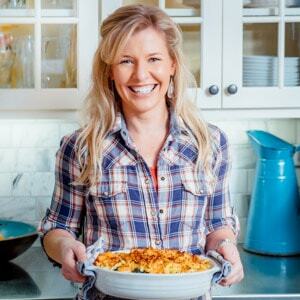 She is a rockin awesome photographer and always comes up with really creative healthy food. She is an omnivore like me, and believes in everything in moderation. Except when it comes to working out, and in that case we both agree that more is always better. I also love that she is way too dry humored for her own good, and she would absolutely love it if you bought her these emoji masks. [No seriously, don’t do that she may beat you up.] She is just an all around badass cool chick and you can obviously see why she would be my friend to phone while I am drinking maple syrup by the gallon working on my cookbook. Please do me a favor and click through to follow her on social media too. 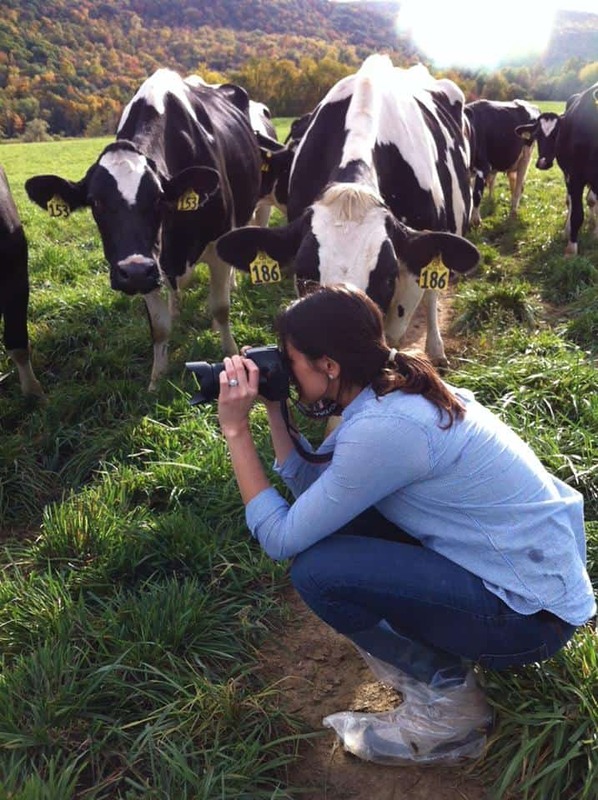 I love this pic of her shooting some happy cows. I asked her to introduce herself with a short bio, so without further ado. Here’s Gina. Here’s the short story about me: I like food. A lot. That’s mainly what you’ll find on Running to the Kitchen. Well, that and the occasional smattering of fitness & sarcasm. I have a weimaraner named Ginger who’s the coolest dog on this planet, I’m a CrossFit junkie and live for red wine and a good steak. The longer version: I lost about 20 pounds a few years ago, got really excited about healthy, whole, seasonal food, rekindled my love of working out and finally got my act together to start sharing all of that online. Running to the Kitchen is all about making healthy food interesting, approachable and fun. This is one of my favorite sites to check in on as Katie’s recipes, photography and intermittent fitness and health stories are right up alley (as evidenced by our last in person conversation at Big Harvest Potluck where I’m pretty sure we talked about how happy picking up heavy weights makes us for at least 20 minutes), so I’m psyched to be filling in for her today as she gets her work on! There’s this pretty ghetto-fied produce store in my town that I frequent at least 4 days a week. I’m pretty much the most inefficient shopper there is. It’s only 3 miles away though so I can get away with it. About six months ago, I harassed the poor Spanish produce guy about kale. The store is owned by a Korean family, but I’ve never heard any of them speak English so I decided to start with the Spanish worker. A 10 year old degree in Spanish is better than the “I know absolutely nothing about any Asian language” alternative. So, in my best really rusty Spanish, I told him this curly kale stuff is lame and Tuscan (lacinto) kale was where it’s at. He looked at me like I was crazy (a fair assessment probably) so I started hand gesturing and pointing at the leaves saying the Spanish equivalent of “curly, no good. Flat leaves…yes!” He smiled, nodded and I was pretty sure it was all just in an attempt to get me to push my cart down the aisle and out of his face. So I said, “bueno…” and moved on. About two months ago, Tuscan kale appeared on the shelf. I think I literally gasped out loud in front of the stuff when I saw it and started frantically looking for the produce guy. He was in the corner stocking the super scary looking meat case (that holds full heads of some poor skinned animal on occasion. Let it be known I do NOT buy meat from this place) when he saw me holding the kale in the air and waving like a lunatic and gave me a thumbs up with a smile. So, I buy Tuscan kale at least twice a week now to show Juan (I’ve since learned his name) my appreciation and while I do love it, I was getting a little bored of the typical quick sauté it usually becomes on my dinner plate. 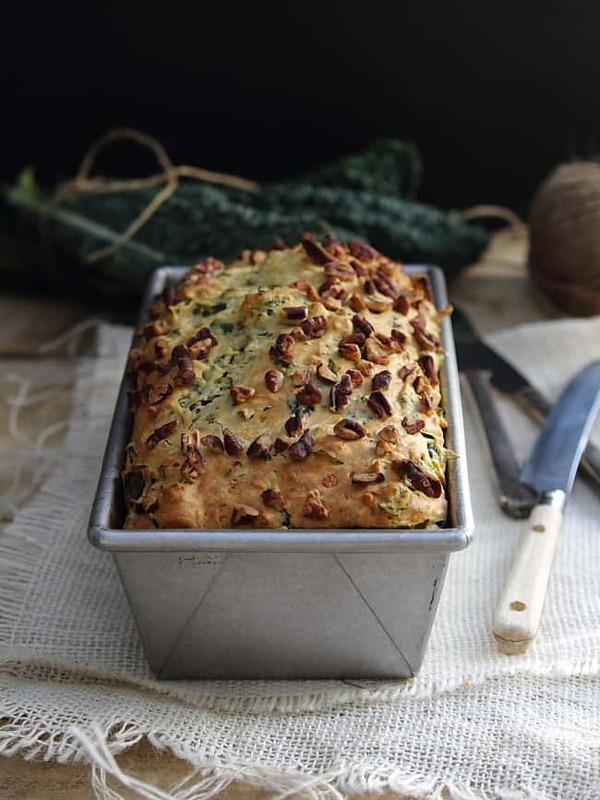 Mixed in this bread with feta and a combination of hearty einkorn and whole wheat flours, it’s a fun savory twist on my favorite vegetable as of late. It’s just as good warm with a smear of butter as any sweet bread would be and it goes deliciously with breakfast eggs and a side of bacon. 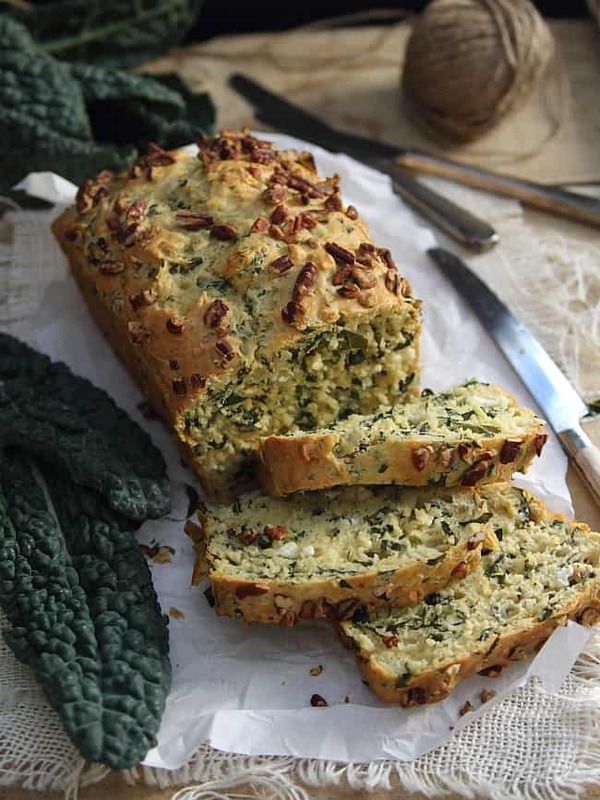 Savory quick bread made with einkorn flour, kale and feta by Gina of Running to the Kitchen. Combine the flours, baking powder, salt, pepper, kale and feta in a large bowl. This bread looks INCREDIBLE and love Gina and her recipes she is definitely talented. It really does to me too Amy! Thank you for coming by. This bread looks incredible! We buy kale almost every week at the store, but I hadn’t tried it in bread yet. Yum! I have a whole row of it in my garden this year. It is one of our very favorites. Yes I totally agree Eileen. I love me some kale. I’ve eaten it in both those combinations, Eileen. Soup is my favorite! This looks so so good. I would love a piece now. Thank you for stopping by Norma. I agree it looks delish! this is the most creative and yummy looking bread I have ever seen!!!! those slices just look so moist and delicious, I am dying for a piece! It really is creative isn’t it? So great you’re back Christine. I’ve missed you. Just out of oven for carb side to dinner. Have a type 1 diabetic son (24) so we need good carbs. Loved it. Didn’t have fetta so grated haloumi instead, added dried oregano and chopped parsley and grated Parmesan to top. Thank you !! Can’t wait to adapt and experiment more. 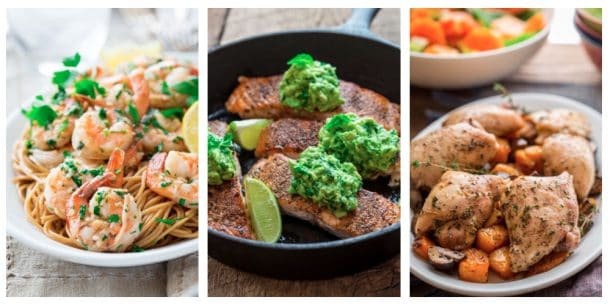 I have made this recipe several times – it’s easy and delicious!! I have had to substitute wild spinach for the kale due to availability issues and it worked perfectly!! Had a lot of extra kale in the garden, found this recipe looking for a way to use it. Excellent! Thanks. I just stumbled across this and was immediately intrigued, this sounds fantastic! I’m a Tuscan kale fanatic. Never heard of einkorn flour though, could I substitute it and use all whole wheat flour, or coconut flour, or what would you suggest? Hi Becky! Whole wheat flour would be a great sub, or whole wheat pastry would be fine too. Einkorn is just an ancient grain wheat hence the fancy name. Coconut flour would definitely NOT work though. Hi Gina, I made this bread today and it won second place at our very competitive work potluck! I used all whole wheat flour and doubled the recipe, came out fine. Seemed to take extra time to bake though, maybe because the kale I used was still partially frozen (stored after an enormous harvest earlier this summer). My coworker brought her twin toddlers and they both loved the bread as well. This is definitely a keeper. Can I substitute a different type of flour and have it turn out relatively the same? That sound be fine. Try white whole wheat or whole wheat. Just made it and it was lacking something. I wanted to like it but perhaps it needs some oregano or dill to give it flavor. Sorry, looks nice, but not something I’ll make again.